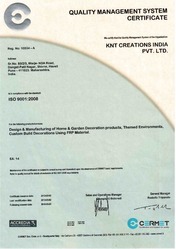 An ISO 9001:2008 Certified Company, "KNT Creations India Private Limited" was established in the year 2010 and engaged in manufacturing, exporting, wholesaling, retailing & service providing Garden Decoration Products. The range offered by our company includes Fiberglass Planters, Fiberglass Bamboo Terrace Planter, Ring Stone Small Planter, Rock Planter, FRP Bamboo Planter, Wishing Well Planter - Wall Hanging, Bunny Rabbit Planter, Antique Planter Fiberglass, Fiberglass Urn, Ring Stone Planter Wall Cladding Texture Panels - Flint Stone, Outdoor Wall Cladding Fiberglass Texture Panel -Beige Stone, FRP Stone Square Textures Panel and Fiberglass Wall Cladding Panels. We have utilized glass matt, polyester resin, and other raw materials in the fabrication of these items that are sourced from some of the genuine and authentic vendors of the industry. These items are used in Homes, Hotels, Restaurants, Commercial complexes, Sports clubs, Educational institutions, Amusement parks, Government & private organizations and other areas for increasing the beauty of the place. We have established well-equipped infrastructure in our firm that facilitates us to make the best quality products in the market. Our well-trained professionals also help us in completing all tasks within the given time span. Under the leadership and supervision o four mentor Mr. Kedar Tumne, we have successfully carved a niche in the industry and gained an enviable position. To manufacture and consolidate various garden and home decor products for worldwide distribution. Continuously strive for "value for money" for our customers. To become world leaders in making home and garden décor products and have satisfied customers and employees.
" World-class manufacturing, Customer Satisfaction, Timely delivery "
Our organization is well led by our founder Director, Mr. Kedar Tumne who is Mechanical Engineer having an incisive interest in crafting and designing decorative products. He has the expertise in transforming any natural design into an innovative and unique one. Owing to his creative mind and rich industry experience, we have been able to carve a niche in the market. We are also supported by our second founder Director, Mr. Nihar Tumne, who has industry experience of more than a decade. He holds a formal degree in polymer engineering and is a ardent marketer. Moreover, owing to his distinct market, we have been able to create a niche in the international market. By joining the valuable suggestions of both the mentors, we are able to deliver a distinct range of products to Indian and international market. Our mentors collectively supplied different products to domestic as well as international companies from Europe and America. All the products are manufactured using high quality material such as polyester resin and glass material. Our range of products is widely used in various homes, hotels, restaurants, offices and government & private organizations. We started our business with a vision to attain utmost client satisfaction by offering quality Garden Decoration Products. These have gained appreciation from the clients due to their attractive designs, vibrant colors and smooth edges. We are formed by a strong and diligent workforce, which assist us in accomplishing all the organizational tasks within the prescribed time frame. All our employees are recruited on the basis of their skills and knowledge. They work with their mutual understanding that maintains the decorum in company. Our skilled and determined professionals enable us to cater the diverse needs of the clients in best possible manner. Being a client oriented organization; all our endeavors are directed towards providing all kinds of handicraft products to our clients. For this, we have highly qualified staff and wide distribution that help us in delivering our range of Garden Decoration Products to our clients within the stipulated time frame. Our core business is to source a variety of products which includes traditional items of arts and crafts, components to semi-finished products. Moreover, our associate office is situated in Dongguan city in China by which we can easily source all kinds of products from China as per the specific requirements of our clients. With years of experience, we are consistently engaged in serving the clients in best possible manner. Our products are made in adherence with the international quality standards and norms. All the product offered by us are well checked and analyzed on set industry norms. We follow ethical business policies, and transparent dealings that make us the first preference of the clients. The range offered by us at most affordable rates in market.